It’s raining and/or snowing and, amazing, it’s still not pay day. Get the onesie on and get on that couch. 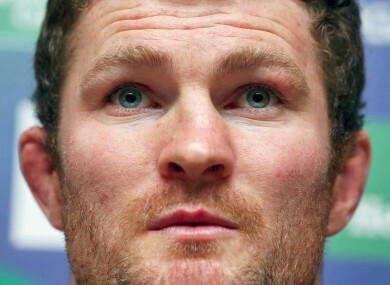 Donnacha Ryan: big weekend for Munster. One to Sky+: Lance and Oprah tonight. That’s sport right? One to skip: Rory and Tiger miss the cut? Think we’ll miss the Abu Dhabi Golf. Basketball: NBA, Boston Celtics v Chicago Bulls (ESPN, midnight). Golf:European Tour, Abu Dhabi Golf Championship (Sky Sports 1, 6am, 10am); PGA Tour, Humana Challenge (Sky Sports 3, 8pm). Motorsport: Dakar Rally, (Eurosport, 5.45pm). Rugby: Heineken Cup, Heineken Cup, Connacht v Zebre; Biarritz v Harlequins (Sky Sports from 7.30pm). Football: npower Championship, Leicester v Middlesbrough, (Sky Sports 1, 7.30pm); Bundesliga, Schalke v Hannover (ESPN, 7.30pm). Snooker: The Masters (BBC2, 1pm; Eurosport 2, 1pm: Eurosport, 7pm). Tennis: Australian Open (Eurosport, 6am, midnight). Boxing: Prizefighter, (Sky Sports 1, 8pm). Cricket: ODIs, India v England, (Sky Sports 1, 6am), South Africa v New Zealand, (Sky Sports 4, 11.30am); Australia v Sri Lanka, (Sky Sports 2, 3am). Football: Premier League, Liverpool v Norwich, (Setanta Sports Ireland, 2.30pm), West Brom v Aston Villa, (ESPN, 4.30pm); Premier Soccer Saturday, (RTÉ 2, 8pm). Clydesdale Bank Premier League, St Mirren v Ross County, (Sky Sports 2, 12.30pm); npower Championship, Blackpool v Cardiff, (Sky Sports 2, 5pm); Primera Division, Real Sociedad v Barcelona, Getafe v Sevilla, Malaga v Celta Vigo, (Sky Sports 4 from 5.15pm); Serie A, TBC, (Setanta Sports Ireland, 7.40pm, ESPN, 7.45pm); African Nations Cup, South Africa v Cape Verde, (ITV4, 3.30pm, Eurosport 3.45pm), Angola v Morocco, (Eurosport, 6.30pm). Golf: Abu Dhabi Golf Championship, (Sky Sports 3, 9am); Humana Challenge, (Sky Sports 3, 8pm). Horse racing: Ascot and Haydock Park, (Channel 4, 1.30pm). Snooker: The Masters, (BBC 1, 1pm). Tennis: Australian Open, (Eurosport, 6am and midnight). American football: NFL, San Francisco at Atlanta Falcons, Baltimore Ravens at New England Patriots (Sky Sports 2, 7.30pm and 11pm). Basketball: NBA, Toronto Raptors v Los Angeles Lakers, (Sky Sports 3, 6pm). Football: Premier League, Chelsea v Arsenal, Tottenham v Manchester United, (Sky Sports 1 from 1pm); Clydesdale Bank Premier League, Motherwell v St Johnstone, (ESPN, 2.15pm); Scottish Third Division, Peterhead v Rangers, (ESPN, 11.30am); Primera Division, Atletico Madrid v Levante, Valencia v Real Madrid, (Sky Sports 1 from 6.30pm); Serie A, Fiorentina v Napoli and a match TBC, (Setanta Sports Ireland from 11.25am), AS Roma v Inter Milan, (ESPN, 7.15pm); Bundesliga, Fortuna Dusseldorf v Augsburg, (ESPN, 4.30pm); Ligue 1, Bordeaux v Paris Saint-Germain, (Setanta Sports Ireland, 7.45pm); African Nations Cup, Ghana v DR Congo, (Eurosport, 2.45pm), Mali v Niger, (Eurosport and ITV4, 5.30pm). Golf: Abu Dhabi Golf Championship, (Sky Sports 3, 8am); Humana Challenge, (Sky Sports 3, 8.30pm). Snooker: The Masters, (BBC 2, 1.55pm, 8pm). Rugby: European Cup, Munster v Racing Metro, Leicester v Toulouse, (Sky Sports 2 from 12.30pm). What have we forgotten, couch potatoes?